You’re probably going to want one of these. 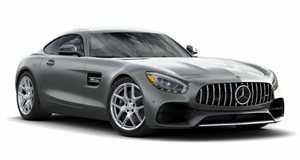 Along with the recently unveiled Night Package, buyers of the Mercedes-AMG GT will have a choice of three optional styling packages when they order the all-new sports car, with the German carmaker revealing the first images and details of its Silver Chrome and Carbon packages. Priced at 4,700 Euros, the Carbon Package adds a carbon-fiber front splitter, rear diffuser, mirror housings and fender fins, as well as gloss-black diamond grille, air intake grille, and hood grilles. The Silver Chrome kit, priced at 1,130 Euros, includes a silver chrome front splitter, diffuser, fender fins and a chrome diamond grille. It also boasts gloss-black highlights and a aluminum silver roofline trim strip. All three optional packages are available with the AMG GT and AMG GT S, but cannot be combined with each other.